Every night we have campfire, during which skits, songs, stories, and games keep everyone amused. At this time, the Black and White Knights and their hideous assistants may appear to duel in canoes as they have for decades. A hirsute Esther Williams and her water nymphs might perform some synchronized swimming. Or perhaps Johnny Credit Card will perform one of his memorable ballads. 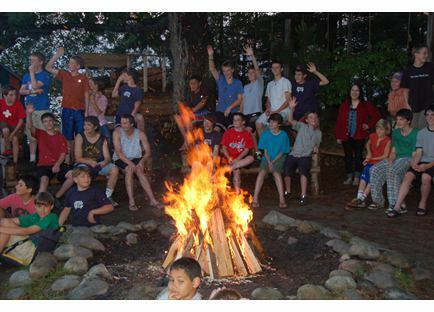 Participation in Campfire is open to everyone and provides an opportunity for creativity and self-expression that is increasingly rare in today's digital world.